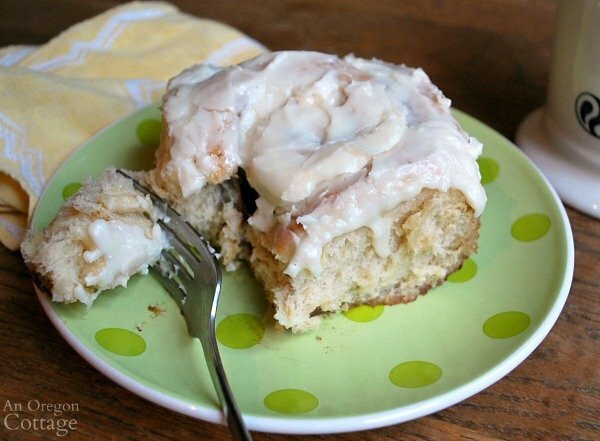 These seriously are the BEST cinnamon rolls – friends and family tested and approved. Served warm and frosted, these are just the right mixture of cinnamony goodness. Other great bread recipes are on the Best Bread Recipes page! Yes, that’s a period in the title – as in The Best Cinnamon Rolls, period. I could’ve also said: Ever. In The World. In The Universe. Or You’ve Ever Eaten. And I wouldn’t be exaggerating, tooting my own horn, or overstating it at all. I know there are hundreds of recipes out there for homemade cinnamon rolls – some even with “best” in the title, too. But I’m going to lay it on the line – they might be good, but these are better than any others I’ve tried (and the recipe by a huge blogger that gets written up all over the internet as the best? All I’ve got to say is baking powder and soda have no place in a yeast dough – ever. Unless you want cinnamon biscuits, that is…). How can I be so sure? Fifteen-plus years of testimonials from family and friends. These are a special labor of love that I make only a couple times a year, but they are requested for every major family gathering. And they are loved. My sister and brother-in-law told me once that they went out of their way on a hiking trip near Canada to stop in a little cafe that they read had the most awesome cinnamon rolls. She shook her head sadly as she told me they were not nearly as good as mine. And that she sorta felt sorry for the people who thought they were getting the best cinnamon rolls (yes, she’s a sweetie). So I’m not putting the title on these lightly or flippantly or just to get Google traffic. And the reason I haven’t put them on the blog before? Well, they are a special recipe – I might even go so far as to say my best recipe – and I wasn’t sure I wanted it published. Well, that and the fact that I knew it would take a long time to photograph, edit, and write up…a-hem. But I love all you guys, too, and since I can’t make them for you…posting the recipe is the next best thing! So here is my gift to you: The Best Cinnamon Rolls – and of course a tutorial to walk you through the steps (which aren’t hard, by the way – I promise that, too!). Note: This is the tutorial below to walk you through the recipe and not all recipe amounts are given. Click here to to to the full, printable recipe. 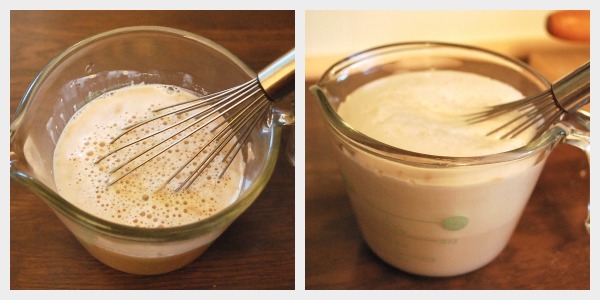 Mix yeast, warm tap water, and a bit of honey in a measuring cup and set aside. You’ll want to move quickly to the next step, because it will grow to fill a 1-cup measure in only a few minutes. Using a large mixing bowl, combine warmed milk, sugar, butter, salt and eggs. You can see in the photo that it won’t actually combine. Just mix them together as best you can and then add the bubbling yeast mixture and stir it in. Add half the flour (3 cups) and beat on medium speed until smooth – about a minute. Stir in another 3 1/2 cups flour to make a stiff, yet sticky dough and change to a dough hook. Knead with the mixer for 5-6 minutes, until the dough is clearing the sides, but still sticking to the bottom. Add only enough extra flour – a tablespoon at a time – to have it just clear the sides, as pictured (to make by hand, turn out onto a lightly floured surface and knead for 8-10 minutes). Turn the dough out into a large, lightly greased bowl for rising. The dough should still be soft, sticking to the bottom of the bowl like pictured, but not sticking to your finger when you lightly touch it (similar to another awesome bread recipe, my 100% Whole Wheat Dinner Rolls). 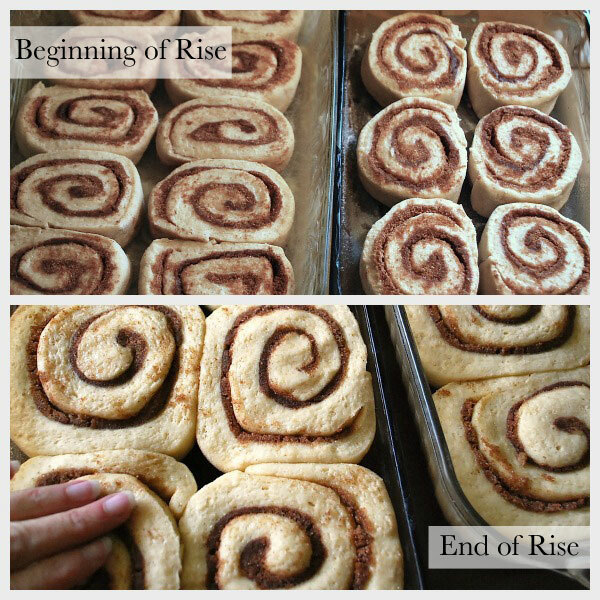 Cover and let rise until doubled, 1 to 1 1/2 hours. The picture is the doubled dough – it’s not typically smooth like some doughs. Turn dough out onto a lightly floured surface (I always use a tea towel) and let rest for 5 minutes. While dough is resting, prepare pans and filling. Divide a 1/2 cup of butter: put 1/3 cup into a pan or glass cup to melt and split the remaining butter between the baking pans. I use 2 glass pans, a 13×9 and a 11×7 inch, fitting 8 rolls in the larger pan and 6 in the smaller pan. (It’s easiest for me to divide the butter up first, like pictured, and then melt it in the pans and cups using a microwave. If you want to melt in a pan, you can pour the entire amount of melted butter into a measuring cup and pour a little in each pan until you’re left with the 1/3 cup you’ll need for the filling). Use a pastry brush to spread the melted butter all over the pans. Sprinkle a sugar-cinnamon mixture on the butter-coated pans. Yes, this is special – go ahead and do it. Mix brown sugar, white sugar and cinnamon (lots!) in a small bowl. Roll out the rested dough into a 15 x 20 inch rectangle, pour the remaining 1/3 cup melted butter on top and spread evenly – but make sure not to lose it over the edges. I use a pastry brush and go close to the edges only. The butter will be pooling in spots. That’s good. Evenly distribute the filling mixture over the buttered dough. I usually make a line of the sugar mixture all around the edge first before filling in the center, just to make sure I don’t push any butter off the dough with the sugar – that would be bad. Roll up the dough and pinch the edges to seal. I often take the butter-coated pastry brush and run it along the edge first to help the dough stick better when pinched. Cut into 14 rolls. I cut the roll in half first and then cut each half into a larger and smaller piece. Cut the larger piece of each half into fourths and the smaller into thirds. I use a serrated bread knife which cuts easily, but you can use whatever works for you. Place the cut slices close together in the prepared pans. You may need to re-pinch the ends as you place them. Cover with a towel and let rise in a warm place until doubled, 45 minutes – 1 hour. Start preheating the oven to 350 degrees about 15 minutes before ready to bake. See my fingers on the risen rolls? That’s to show you that I often push down any centers that are popping up before putting them into the oven. The standard response to the problem of high centers is that the dough was rolled too tightly. I have found, however that some centers will rise no matter what – so I gently push any down before baking and sometimes after, too, which makes it easier to frost. It doesn’t seem to hurt them and it’s usually only a few. Bake the rolls 18-22 minutes, until lightly browned, rotating halfway through if needed. The smaller pan is usually done first in the lesser time and will need to be removed, letting the larger pan continue to bake. Cool the rolls on a wire rack for a few minutes while you mix up the cream cheese frosting. 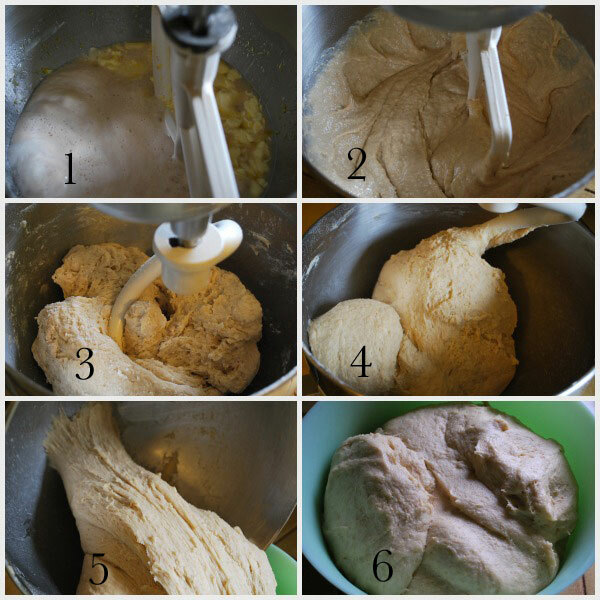 Divide the frosting evenly among the warm rolls using a large spoon and then spread to fully cover. Yes, this is a frosting – no wimpy glaze allowed! As the rolls continue to cool, the frosting seeps into all the crevices, mixing with the filling and creating…well, cinnamon roll heaven. See if my family and I are right about these rolls – but don’t blame me if you find you’re spoiled for any other cinnamon rolls. We are, too! 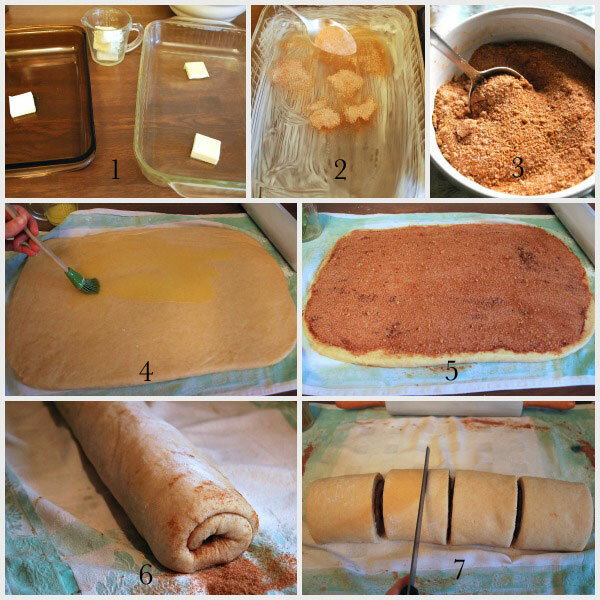 Click the arrow for the complete printable cinnamon roll recipe! 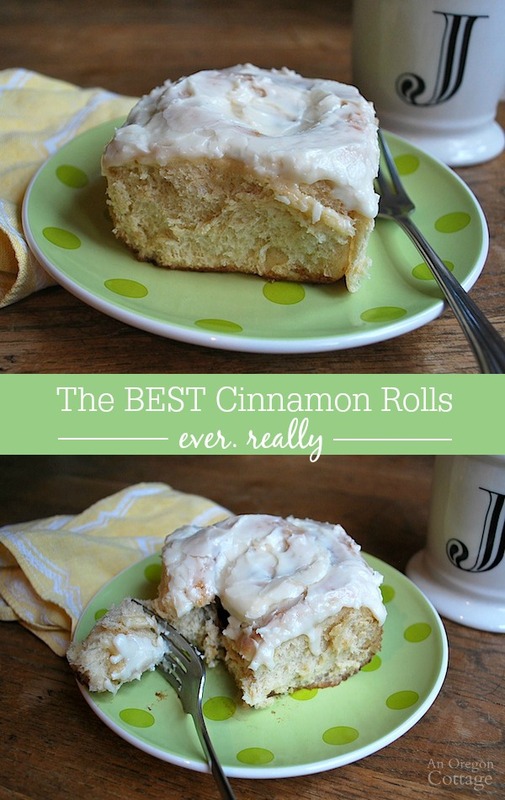 Yes, Jami, these ARE the best cinnamon rolls! I had a beloved recipe that, after a few years, I just could not get right any longer. 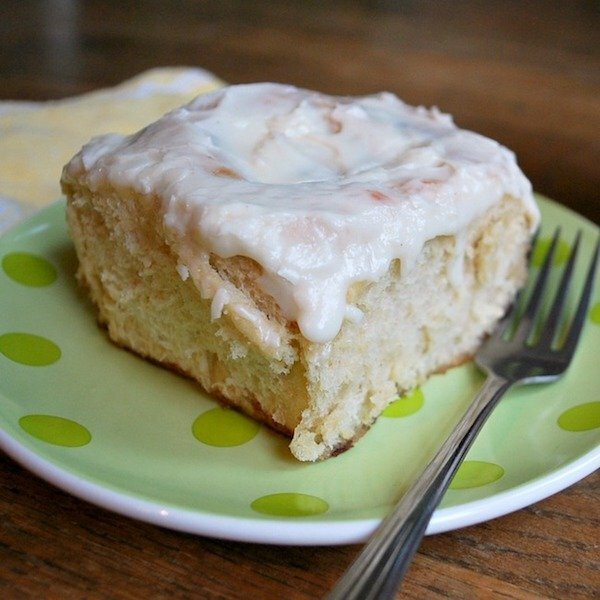 I went on a “quest” to find a cinnamon roll recipe to replace my beloved recipe. I made these yesterday for today’s breakfast. There were many words of absolute delight as my family enjoyed the rolls. Thank you so very much for sharing this recipe here. Have a lovely day and God bless! As for the rolls, I have tried it and they are okay, but not the same tenderness. Since I only make them a couple times a year, I keep some of the unbleached flour in order to keep them the texture we like. But it’s up to you – try it and see if you like it! These were unbelievably amazing!! I used all whole wheat (hard white) flour and it worked great. I can’t thank you enough for sharing this recipe! It’s a keeper!! SO happy you liked these, Julie – and with all WW! 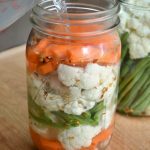 Im new to your blog and really like the look of your recipes. im volunteering to make a lot of goodies for a bake sale, where i’ll sell individual servings vs a whole loaf etc. i keep trying different cinnamon bun recipes, some are too dry, one almost put my oven on fire with too much butter dripping out of the pan. also helpful to know what mixer you like. i do get intrinsic enjoyment out of kneading dough by hand, but i do a lot of baking for http://www.foodonthecorner.ca and a mixer would be useful, the ‘reconditioned” option was helpful to know about. 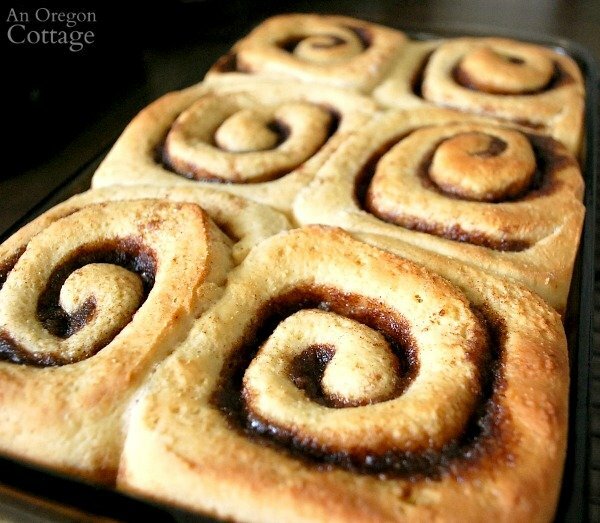 I just want to say these are really the BEST cinnamon rolls ever. I’ve made them countless times over the last couple of years and everyone raves about them. I did have a question though. I’ve found that by the time I’ve put all 6 cups of flour in, the mixture has already reached the consistency you talk about. Clearing the sides but still sticking to the bottom. Usually I end up almost skipping the dough hook part because I’m afraid I will over work it and it will be tough. Any idea why this could be? I have always used unbleached all purpose flour for all 6 cups. I’m not sure if it really makes that big of a difference but if I can improve what I’m doing I’d love to know! Thanks again for the wonderful recipe!! I use normal flour, Julie – unbleached instead of the bleached white flour here (not sure if you have those options), basically whatever you have that’s regular. If I put the whole wheat in (I don’t always) I just use a regular whole wheat – so none of them are bread flours. And it’s a basic dough (though rich with the butter and eggs!) so it should work in your bread machine if it can handle that amount of dough. Thank you for sharing this recipe. I might actually be brave enough to try it. Would inside the oven be an effective place to let the rolls rise? The temperature in my kitchen is always pretty cool. I hope you do! I can never quite figure the oven for rising, but I think if you heat it at the lowest temp and then turn it off maybe that would work? I’d check at 30 min. to see if it was still warm, though. A quick question. Am hoping to make these later today. Your recipe calls for “warmed milk, sugar, butter salt and eggs.” In other recipes I miexed all these together in a pan on the stove. Is that what you do, or do you just warm the milk, then add the other ingrediants to the warm milk once it’s in the mixing bowl? I make homemade cinnamon rolls each year for Christmas morning. I will be making this recipe this year and will let you know how they turn out. I trust you because we’ve had success with so many other recipes of yours! I usually refridgerate the dough before the second rise on my recipe and take out and let rise the next morning, then bake. I love the idea of completely baking, then reheating. I also always make a batch for my sister’s family so they can enjoy and feel my love on Christmas morning. About how long would you say you gently reheat so I can tell her? Jami, these turned out just like you said they would! When my son ate his he commented that these were the best cinnamon rolls ever, without knowing the name and also said he was in heaven eating them! These are the new go to for a special treat! Thanks so much for sharing your talents! So totally impressed over and over again! LOVE reading this, Brittany – thanks so much for sharing your son’s reaction! 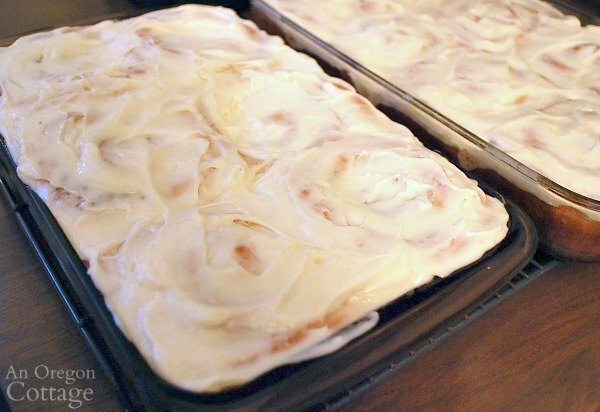 Oh my goodness, these really are the BEST cinnamon rolls ever! I made them today for my hubby and four sons. They loved them! I am pretty picky about cinnamon rolls and I’m always trying to find the perfect cinnamon roll. This is it!! Thank you for sharing your recipe!! Thank you so very much for being generous enough to share one of your best recipes. 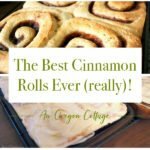 I’ve tried too many cinnamon roll recipes to count and thought I’d found a keeper until I tried this recipe. We performed a taste test in our home, comparing my previous favorite recipe with this, and your recipe won hands down. I could not be more delighted to find a recipe that uses WW flour with such great results. The word my DH used was “squishy”, which is high praise! I have a question: my rolls looked wonderful going into the oven, but collapsed a little after baking. It didn’t affect the taste, but I wondered why that happened. I did a little research and one suggestion is that I used too much yeast. The 2 TB called for is more than any of the other recipes I’ve used. Is more yeast required because of the WW flour? Just curious. Thank you again for a winning recipe! Glad they won the taste test, Linda! They sure do in my family. 🙂 Hmmm, it depends on what you mean by ‘collapsed’ – the entire rolls or just the centers? When I don’t get the dough rolled evenly, the centers sometimes descend after baking, leaving spaces between the layers. Other than that, they pretty much always turn out like pictured for me – and I always use the 2 TB yeast. I think it’s that much because it makes a large amount of big rolls, it’s pretty much a double recipe of a regular roll recipe. I also think of the recipes I use a lot of yeast in and it’s always soft breads that you want light and airy, so that’s got something to do with it, too. One more thing to think about: I’ve overproofed bread before and it collapses after cooking, so make sure not to let them rise too long. Hopefully you won’t have that happen the next time you make them! Thanks for the suggestion Jami. You may be right that I let the dough rise too long….on the first rise I got distracted and by the time I returned to the kitchen the dough had almost spilled over the bowl. Also, I should have mentioned that I used instant dry yeast. I read that you can reduce the amount by about 25% if using instant yeast because it has smaller granules and is a little more compacted than active dry yeast. I’ll be more careful with the rise next time, and if that doesn’t do the trick I’ll try reducing the amount of yeast. Even with slightly collapsed rolls, this recipe is a winner! Hi Jami! Another fabulous “share”! I tried this recipe today, the first time I’ve made cinnamon rolls & they were absolutely wonderful! However, I didn’t realize that I was almost out of vanilla, so I wound up using 1 teaspoon of vanilla & 1/8 teaspoon of orange oil that I had on hand from making Divinity. They were super-duper good, as my 13 year-old niece said! Thanks for sharing it!